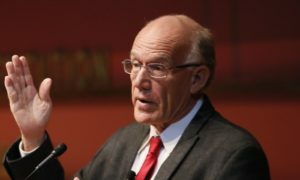 Victor Davis Hanson is a nationally published columnist and VERY accomplished military historian. He has written or edited 24 books. Victor’s father flew 40 missions in B-29 over Tokyo and he was named for an uncle killed on Okinawa so he grew up with military history. In graduate school he learned that there was not much written about the vocabulary of ancient military history, and this opened the window to a life long pursuit. “Liberty Watch” and “America Armed and Free” host Charles Heller sits in to add his knowledge and expertise to the conversation. Drawing upon Victor’s expertise researching thousands of years of warfare, our conversation first focuses on what has changed and what remains the same. Technology may have changed but the laws of strategy and tactics are empirical and immune from technological alteration. The Spartans experienced the “fog of war” just as modern day troops do. There are a lot of criteria that adjudicates whether an army is successful or not. But there are certain aspects that give free market societies advantages both logistically and in terms of battlefield initiative. The reverse side of the coin can be a free society’s perceptions of the grievousness of the loss of their own warriors and the level of violence delivered to the enemy. Professor Hanson highlights this point using World War II strategies viewed through today’s “weird” concept of “proportionality”. Professor Hanson has little patience for modern day historians who try to apply current day morality to past conflicts. When asked to pick his top three historical military leaders he listed William Tecumseh Sherman, Alexander the Great and Matthew Ridgeway. Guest Co-host Charles Heller selected Admiral Charles Lockwood, General Dwight Eisenhower and General Ulysses Grant. TAKEAWAY: “Usually large armies beat small ones; usually armies led by geniuses beat those led by fools. But the western tradition – from freedom to technological expertise can give the disadvantaged side parity sometimes.